Last night I heard the sad news…That our dear teacher Rebbetzin Heller suddenly became a widow yesterday after her husband died from a stroke. It brings tears to my eyes to think of Rebbetzin Heller without her beloved husband, Rabbi Avrohom Dovid Heller z”l. Rebbetzin Heller at Friday night dinner, without her husband. Rebbetzin Heller on Seder night, without her husband. Rebbetzin Heller late at night after a difficult day, without her husband. Her confidante. Her soulmate. Her fellow builder of a large and distinguished Jewish family and an empire of Jewish outreach and education that has touched and changed the lives of thousands of Jews (including this one). I know next to nothing about Rabbi Heller z”l besides a few sparse biological details. I know he was born in 1944 and was raised in Boston. I know he learned at Yeshiva Rabbenu Chaim Berlin and worked as an administrator of Yeshiva Pachad Yitchak in Jerusalem. I know he was a respected Torah scholar who is survived by his wife, fourteen children, and many grandchildren. And I know that he was famous in his community for his many acts of kindness. But the greatest kindness he did in his lifetime, I think, is give us his wife, among the most influential English-speaking female teachers in the Orthodox world today. My teacher Rabbanit Yemima Mizrachi once told us that her husband, Rabbi Chaim, had been approached by an elderly woman who had exclaimed, “Oh! So YOU are Rabbi Yemima!” And Rabbanit Yemima pointed out that everything she has achieved as a world-renowned educator is in the merit of her husband’s support and encouragement. And, I might add, in the merit of his willingness to accept and even embrace his role as “Rabbi Yemima.” Not every man possesses the quiet inner greatness and humility necessary to be married to a far more famous wife. And this is the greatness that Rabbi Heller possessed, and in its merit thousands of women are today more deeply connected with Hashem and the Torah. What’s one to do with one’s desire to marry in order to build, and with whom can one build? The truth is that people tell you many different things. I read the marriage books sometimes… It seems to me that many of the marriage books are very subjective, based on the author’s very sincere but subjective personal experiences. So the advice ranges from “You absolutely have to feel head over heels connected, otherwise you’re cheating yourself” which I saw in one book that’s widely read to an interview I saw once with Rav Shach who said “In one conversation you can see [if you could can marry a person.] In one conversation you can see if you can build, if you have the same vision.” If you would have spoken with him about emotional resonance, I’m not sure he would have had any idea what you want! But this was his experience and this is this woman’s experience. I’m not going to say that either party is unwise or insincere. But what I will say is that when we look at divrei chazal we come back to our prototypes of masculinity and femininity: Can the man provide? Can the woman receive and build? And these are really the main questions. So obviously, different people, given their different talents and abilities and proclivities, could only build with certain materials. You can’t just marry anyone to anyone. But there has to be vision. There has to be a vision of what will come forth, other than immediate pleasure, other than the gratification of saying “I found somebody,” other than the fact that it’s cheaper to rent an apartment if two of you are sharing the bills. There’s got to be more than that. From what people told me about the DP camps after the War, there were three, four, five weddings every single day in the large camps…these men and women knew that they were very, very, very hungry. Hungry for building. Hungry for future. Hungry for simcha. [The point of marriage on a mystical level] is to make Hashem known in the world. What does that mean? It means to reveal goodness. It means when you’re talking about building together, we’re talking about having a joint plan for revealing goodness: goodness in each other, goodness in the world, goodness in your future children. So how do we reveal goodness? This process begins by believing that goodness is there. You can’t believe something could be revealed if you don’t believe it’s there. In order for that to happen she has to be able to see something that she truly, truly respects in the man. It doesn’t matter always what it is. Even if what she respects is his sincerity or his honesty as opposed to his specific achievements. And build she did. And build he did. And build they did, together. May Rebbetzin Heller and her entire family be comforted among the rest of the mourners of Zion and Jerusalem. 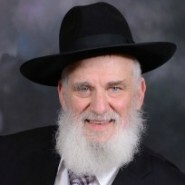 You have written a beautiful and fitting tribute to Rabbi Heller, ob”m. May his entire family, including his talmidim, be comforted among the mourners of Zion and Yerushalayim, and may we have no more tzaar. Thank you for the moving post. Knowing the Heller’s personally, it was amazing to see how Rabbi Heller was so proud of his wife’s accomplishments, how they functioned as a complete unit. BTW, His correct name wass Avrohm Dovid. What a beautiful tribute to what composes a beautiful marriage. Putting this together with the 5th marriage of your cleaning lady, it would seem that if a marriage is not based on mutual building, with Hashem’s help, mutual building can occur when our vision becomes clear and commitment is made. Certainly, families such as the Hellers help us see the value in building a beautiful marriage, home, family, and generations that ultimately transform Klal Yisroel into the Holy People we are meant to be. Thank you for your wonderful words….exactly what needs to be said about this remarkable man. I just heard the news and went online at 2am hungry for comfort and I found your tribute. May Hashem grant Rebbetzin Heller and her children nechama and the strength to absorb this huge loss. If he could give us his wife so fully, we can only imagine and wonder what he might have given of himself to others…. Thank you for the beautiful article. When I went over to Rebbitzen Heller at the shiva to recite the posuk, she thanked me and asked who I was as she does not recognize me. I told her that I attend her classes and came because she teaches me Torah. May HaShem comfort her and her family and may she continue to be a living example for us all. My late husband and I met Rav Heller, z”l, and Rebbetzin Tzipporah only once, at their son’s home for Shabbat lunch (I didn’t know at the time how famous she was.) They were both delightful and inspiring. When I lost my husband suddenly, Rebbetzin Heller sent me a book on mourning and called me regularly for the next few months to check up on and encourage me, even though she barely knew me. She truly lives what she teaches. My heart so goes out to her at this time! May HaShem be a strong tower to her and her children in these difficult days. What a tragedy – he was only 69. May Hashem comfort her and her family among the other mourners of Tzion and Yerushalyim. May she continue to inspire others to grow in their connection to Hashem.